British artists dominated Sworders’ (23% buyer’s premium) Modern & Contemporary prints sale in Essex, with works by Banksy, Patrick Hughes, Damien Hirst, Bridget Riley and Grayson Perry all getting away. 'Love is in the Air' by Banksy – £11,800 at Sworders. The most expensive work in the 438-lot sale on May 9 was Banksy’s (b.1974) Love is in the Air screenprint in colours from 2003. 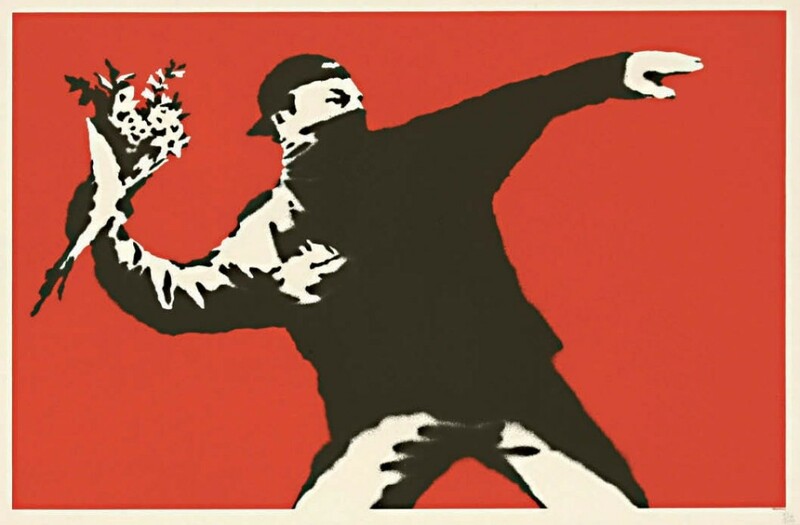 The 19in x 2ft 3in (50 x 69cm) image of a protester, his face covered with a bandana and about to throw a bouquet of flowers, is among the street artist’s best-known creations. Published by Pictures on Walls in an edition of 500 and numbered 332, it was accompanied by a certificate from Pest Control, Banksy’s authentication body. Estimated at £10,000-15,000, it was knocked down to a UK private buyer at a respectable £11,800. Although such prints have made more at auction, these tend to be from the smaller run of artist’s proofs. Other results included a Bridget Riley (b.1931) screenprint, To Midsummer (Schubert 34), printed by Graham Henderson, on wove paper in 1989, which was consigned from a local private source. It was purchased towards its lower guide by a London gallery at £3800. The same local vendor consigned a colourful abstract Gillian Ayres (b.1930) etching, Sikar II, signed, dated 1993 and numbered 34/100. It got away at £1350 against an £800-1200 guide.